In structural modeling the components of the system are listed and the interconnections between them are specified. In this modeling the designs are described in the form of block diagrams. Components represented by blocks are interconnected by lines representing signals. VHDL Structural modeling code should have 1) ability to define the list of components, 2) definition of a set of signals, 3) ability to uniquely label the component and 3) ability to specify signals to ports. From the syntax it can be seen that, the declaration is similar to that of an ENTITY. 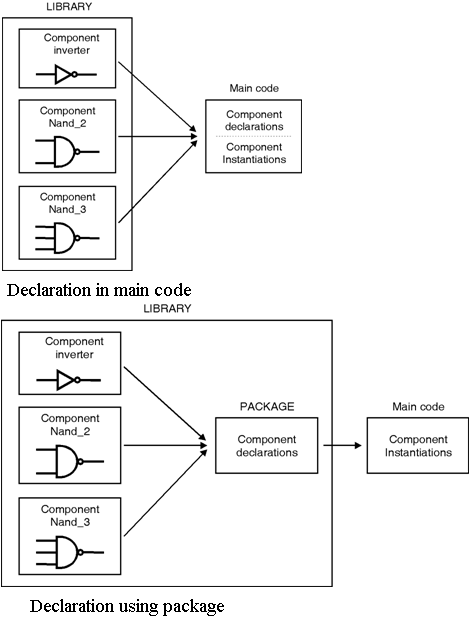 To instantiate the component a label is mandatory, followed by the name of component and PORT MAP declaration. There are two ways to declare a COMPONENT. 1) designed and placed in the destination LIBRARY 2) declared in the main code or declared using a PACKAGE. Figure below show the component declarations. 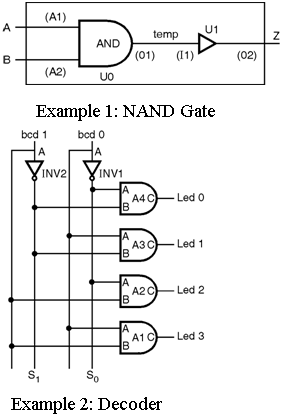 	Example 2 : Structure architecture of Decoder The components Inverter and AND_Gate are instantiated under the names Inv1, Inv2, A1, A2, A3 and A4. The connections among the components are realized by the use of signals S(0), S(1) declared in the architecture's declarative part.